We have a VS C++ code and executable files. Please email me for the passwords. The colorful paper is here. We have compiled results of all the experiments in a spreadsheet that shows the accuracy comparison and execution time (All time measurements are in seconds) to the state-of-the-art. (a) Accuracy comparison between our algorithm and the current state-of-the-art algorithm (b) Accuracy comparison when we use voting based ensemble (c) Execution time comparison between our algorithm and the current state of the algorithm. (a) Accuracy comparison between our algorithm and the original algorithm (b) Accuracy comparison when we use voting based ensemble (c) Execution time comparison between our algorithm and the original algorithm. For our experiments, we use 43 datasets to compare the efficiency of our algorithm to the state-of-the-art algorithm. We attempted tests on all the 44 datasets that we have for original algorithm; however, we abandoned the experiments (14 data sets) in which the original algorithm had not finished after 18 hours. Each row in every file is a time series and the first value of a row is the class label. 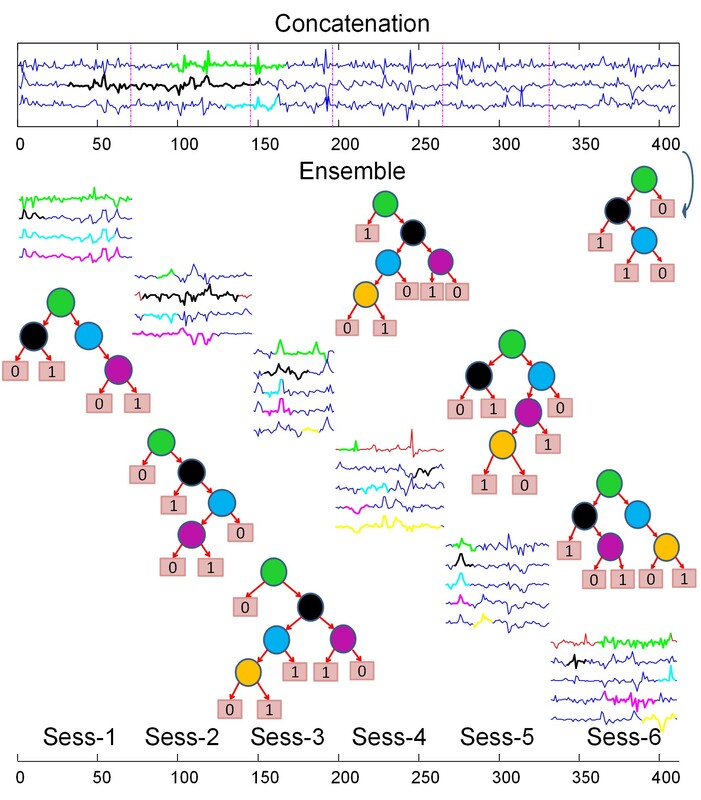 We used the time series of sensory motor network (putamen) component. There are 50(SP=23, HC=27) time series for training data sets and 25 (SP=9, HC=16) time series for testing data sets. The length of each time series is 145. The decision tree from concatenated signals is shown in the top. Three trees from the three sessions are shown in the bottom. Shapelets and nodes in the trees have matching colors. Label 0 represents con-trols and 1 represents patients. Signals in red are from patients and in blue are from healthy subjects. 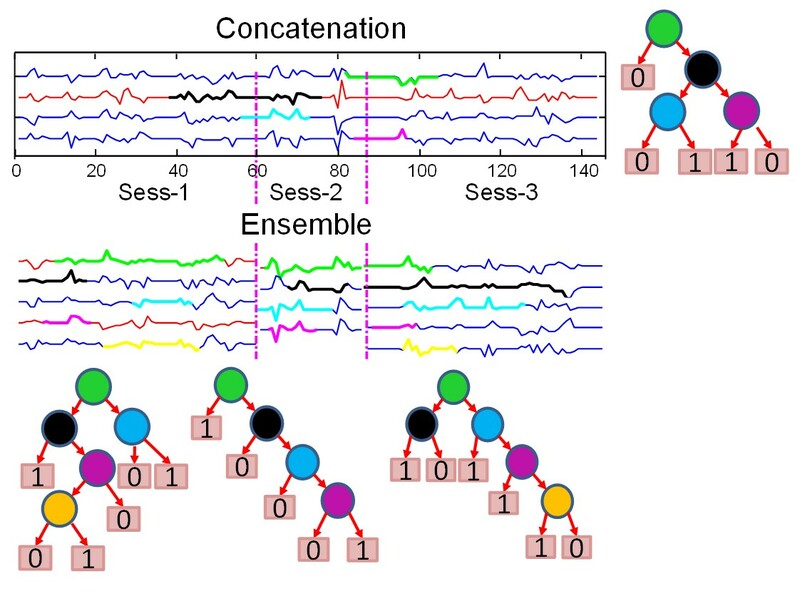 We used the time series of sensory motor network (putamen) component. There are 50(SP=23, HC=27) time series for training data sets and 25 (SP=9, HC=16) time series for testing data sets. The length of each time series is 411. The decision tree from concatenated signals is shown in the top. Trees from the six sessions are shown in the bottom. Shapelets and nodes in the trees have matching colors. Label 0 represents con-trols and 1 represents patients. Signals in red are from patients and in blue are from healthy subjects. The training set contains a balanced (45/44/46) mix of 135 time series of three abdominal channels. The testing set also contains a balanced (42/50/42) mix of time series. The length of each time series is 750. (a) Training set of FECG data for all classes. (b) Shapelets are shown in green. First shapelet classifies the sesnsor-1, Second shapelet classifies the sesnsor-3.